Traumatic Brain Injury (TBI) in the military is different than Traumatic Brain Injury with civilians in some key ways. While both can cause similar physiological damage, and can produce identical signs and symptoms, there is some evidence that there is a higher incidence of emotional trauma following a Military TBI. Additionally, due to in the field constraints, there may be some barriers, in theater, that can challenge the ability to collect accurate documentation on the number of true TBI’s, specifically moderate to severe. According to the DoD, there were 18,311 service members diagnosed with TBI in 2016. Note that they are only reporting first time incidence of TBI. Anyone suffering second, third or fourth injury is not counted in these numbers. During deployment in the military, the leading cause of TBI is blasts, often from Improvised Explosive Device (IED). A concussion is the most common type of TBI: grade I mild, II moderate and III severe. Open Head Injury: Penetration of the skull by bullets, knives, shrapnel, or any object or objects, largely causing focal (localized) direct damage. A Penetrating Trauma is any object that enters the brain usually pushing skull fragments into the brain as well as direct injury from impact. Closed Head Injury: No penetration of the skull, but focal (localized) and diffuse (broad) damage to axons (part of nerve cell that conducts impulses). Often caused by falls, MVAs, IED blasts, or a direct hit to the head either physical or with a blunt object. Deceleration Injuries (Diffuse Axonal Injury): Your skull is hard and your brain is soft. When there is rapid rotational movement, or acceleration and deceleration, the brain differential movement can cause contusion and damage, tearing or shearing the fragile axons. Chemicals/ Toxins: Chemicals and toxins that cause damage to the neurons, such as CO2, solvents, insecticides, lead, etc. Hypoxia (lack of O2) or Anoxia (no O2): Heart attacks, respiratory failure, lack of air, rapid low BP, can all cause brain injuries. Tumors: Cancer can cause direct brain injury by invading spaces in the brain, as well as damage from pressure effects around a tumor. Attempted surgical removal of some tumors can also result in direct damage to the brain. Infections: Viruses and bacteria can cause serious and life-threatening diseases of the brain (encephalitis) and meninges (meningitis). Meninges are the membranous covering of the spinal cord and brain. Stroke: An ischemic stroke happens when a clot forms and prevents blood flow from getting to the brain, causing cell damage and cell death. A hemorrhagic stroke happens when an aneurysm bursts or a blood vessel leaks, causing blood to spill into or around the brain, leading to damage and cell death. There can be a Secondary Injury as well. With an injury to the brain, the swelling and inflammation can trigger cell injury and cell death. The swelling can cause an increase in the intracranial (within the skull) pressure and stop the cerebrospinal fluid from draining out of the skull in a normal fashion. This will further increase the pressure on the brain and can increase the actual damage to the brain. This pressure can force the brain to herniate (push down through) the base of the skull, causing respiratory failure and even death. It should be noted that not all blows to the head result in traumatic brain injury. An injury to the brain is unlike an injury to any other part of your body. While bruises and broken bones usually heal, an injury to your brain may not. It affects all aspects of your life – your ability to think, reason, function, as well as your personality. Recovery is operational, and can vary from person to person, even between those whose injuries appear the same. Symptoms can show up immediately, but can also be delayed days, weeks or months. The symptoms can be vague and lead to chronic problems if left untreated. It is vital to seek treatment immediately to prevent increased risk. Also be aware that many times a person in unaware that an injury has even taken place. This is done through a screening process using three factors at the time of the injury. The Glasgow Coma Scale: This is a 15-point system used to determine and categorize brain injury on the ability to manage daily, independently, or dependent on others. It measures Motor Response (I), Verbal Response (II) and Eye Opening (III). The final score is determined by adding the values of I, II and III. Mild is 13-15, Moderate is 9-12, and Severe is 3-8. A vegetative state is less than 3. A Persistent Vegetative State lasts longer than 30 days. Length of loss of consciousness: This can vary and the time can determine severity. Length of post-traumatic amnesia: State of confusion/ disorientation where you are unable to remember events that occurred after the injury. There are three classifications of traumatic brain injury historically: Mild, Moderate and Severe. Most people make a full recovery from this type of injury. There can, however, be some who have continued problems with things like memory, concentration and attention. They can suffer from trouble with problem solving and decision making. They can also have ongoing headaches or ringing in the ears, confusion, dizziness, and have trouble controlling their anger. Another name for this type of injury is a Concussion. Full recovery can be expected, even with a repeat injury. Recovery is specific to each individual and can be as early as a few hours and as late as weeks. It is important to note that with every concussion sustained, healing time can take longer, and permanent damage to the brain is incurred. CTE (Chronic Traumatic Encephalopathy): A degenerative brain disease found in people with a history of repetitive brain trauma. Depression: A relationship has been found between history of concussion and diagnosis of lifetime clinical depression. Symptoms are multi-faceted and can include loss of interest, loss of appetite, insomnia, suicide. Dementia Pugilistica: Also known as “punch-drunk syndrome”, this is a neurodegenerative disease caused by multiple concussions. Typically manifested with tremors, difficulty with speech, confusion, slower movement, worsening coordination and memory challenges. Neurocognitive impairments: Multiple concussions may put one at risk for lasting, progressive impairment that limits function with increased lack of concentration, irritability and loss of balance, as well as confusion. Slower neurological recovery: Multiple concussions may result in slower recovery or permanent neurocognitive disability. The symptoms of Mild TBI (concussion) and PTSD can be very similar and easily mistaken for the other. With a Severe TBI, long term consequences can include all of the above as well as motor and sensory deficits; cognitive, speech, balance and mood difficulties, and full-blown seizures. The effects of traumatic brain injury can be life-altering and profound. Whether civilian or military, the far reaching consequences deeply impact relationships and family, social interactions, and employment abilities. Every aspect of life can be touched, and not only the service members or civilian patients struggle, but those around them as well. While anyone is at risk for a TBI occurring from sports to MVAs, military active duty and reserve personnel are statistically at a higher risk than civilians. Many routine military operational and training exercises are physically challenging and even dangerous. Additionally, due to the nature of the current conflicts we are engaged in, the risk of routine physical military conflict is compounded by blast exposures from IEDs, suicide bombers, and land mines, to name a few. 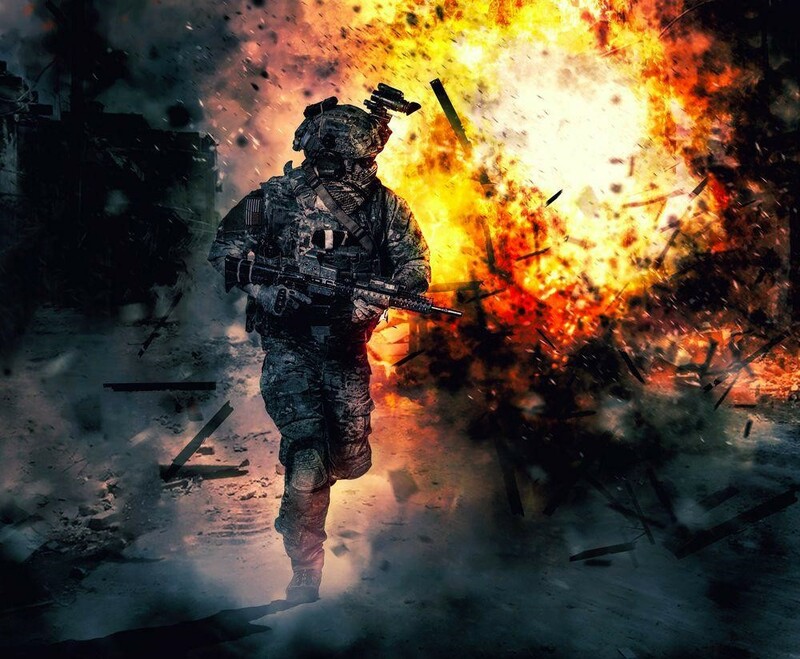 Blast injuries are a common cause of traumatic brain injury in the military. Do to the unique nature of these injuries, the patterns of injury are not seen often in civilian life. The blast has the potential to cause immediate, life threatening, multi-system trauma on many people simultaneously. Many factors play a part in the severity of the injuries – components used, size of the blast and the victim’s proximity to the blast itself. Due to the increased threat of terrorism, civilian medical systems are increasing their ongoing educational requirements to include blast injury protocols and related multi-system trauma response protocols. Disaster response personnel must understand the complexities of injuries caused by explosions and prepare their initial response accordingly. The most common post explosion injuries among survivors are caused by penetrating objects and blunt trauma. Blasts that happen in a confined space (buildings or vehicles) where there is structural collapse have a higher morbidity and mortality. TBI is a common, serious injury from blasts. Blast lung is the most common cause of fatality. The blast causes tearing, hemorrhage (bleeding), contusion (bruising) and edema (swelling). It is characterized by respiratory difficulty and hypoxia (oxygen deprivation). Primary (Blast Wave): This is created by an atmospheric overpressure followed by a vacuum on tissue. Secondary Injury: Shrapnel (or any object placed in motion) by the blast hitting the person’s body. Tertiary Injury: Being thrown by the blast and hitting other objects, such as the ground. 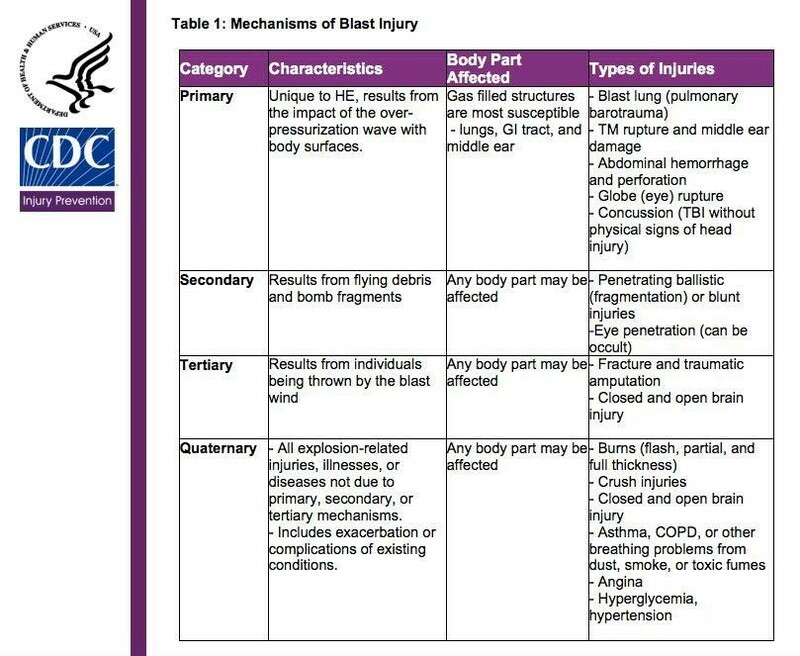 Quaternary Injuries: All other additional injuries from the blast such as burns and crush injuries. These are two main kinds of explosions: HE (High Order Explosives) and LE (Low Order Explosives). It is important to always be honest about how you feel, and any signs and symptoms you may be experiencing. Stay engaged with your medical provider(s), and if symptoms persist or get worse, seek immediate medical care. Follow medical advice and be compliant with your plan of care and recovery. Avoid contact sports, alcohol, tobacco, and get plenty of rest. Take the medications prescribed and use assistive devices and technologies where needed. Learn strategies to deal with health, cognitive and behavioral problems. Go to rehabilitation therapies: PT (physical therapy), OT (occupational therapy) and ST (speech therapy). Engage supportive networks for you and your family. Brain Injury is serious, in any context, and can change your life. Seek medical evaluation for any suspected injury, and also if you have been diagnosed with a brain injury, where symptoms are persistent or worsening. Military Medical Evacuation is generally handled by the USAF aeromedical evacuation program. It initiates on the battlefield with life-saving interventions, on to the closest support facilities, then the continental United States. Those with TBI or concussions are evaluated for the need of inpatient medical services, since many TBI’s have multiple physical injuries as well, especially if blast related. Ultimately, treatment of TBI is optimally carried out at the home duty station where possible. In the event that the home duty station does not have the appropriate resources and assets, the service member will be transported to a location that does, which may be to another service branches’ specialists or facilities. Initial emergency treatment is carried out at military facilities in theater. 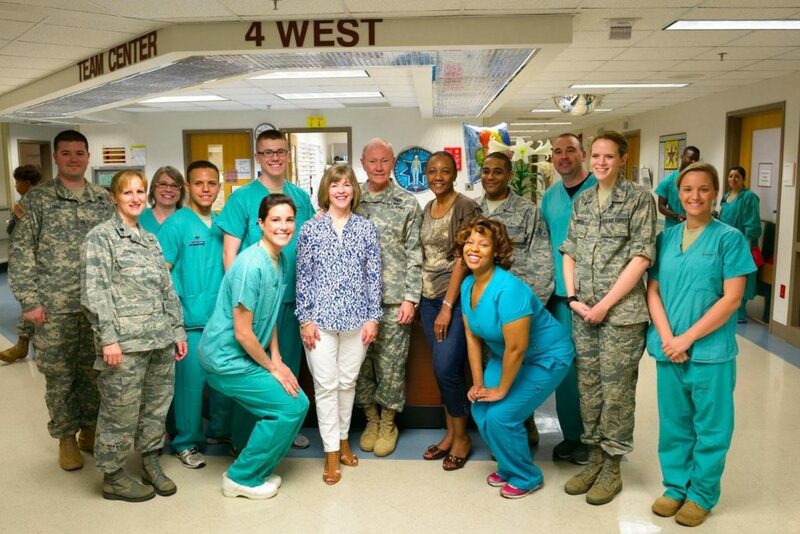 After stabilization, those in Europe, Middle East and Africa are usually transferred to Landstuhl Regional Medical Center (LRMC) by USAF critical care transport teams. If needed, the service member is usually transferred Stateside to designated inpatient TBI centers: Walter Reed National Military Medical Center in Bethesda, MD, or Brooke Army Medical Center in San Antonio Texas. This can take as little as 72 hours. MACE (Military Acute Concussion Evaluation) is the screening tool used for assessing concussions in theater. This alone does not diagnose TBI, but helps in obtaining the event history which helps professionals decide how to best proceed with symptom and cognitive screening as well as a comprehensive neurological evaluation. Always ask for a MACE to be conducted on you if you’ve been through a blast, or make sure affected family/ unit members have had them conducted. 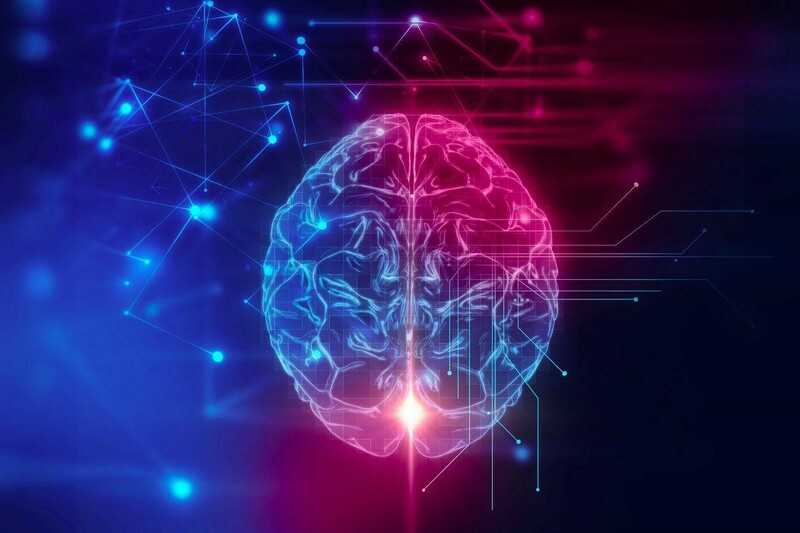 All service members are now required to take a baseline computerized neurocognitive evaluation, using ANAM – Automated Neuropsychological Assessment Metric before deployment. This is referred to as the NCAT (Neurocognitive Assessment Tool). This allows a thorough comparative assessment of service members after they have sustained a brain injury, since they now have a baseline to compare it to. No matter where the serviceman (or woman) receives treatment or care, this database is easily accessible worldwide. All vets should be screened for TBI if they have received any kind of: head injury event, alteration of consciousness subsequent to that event, concussion-related symptoms immediately after or later on, and the presence of current signs and symptoms. PDHA (Post Deployment Health Assessments) should be sure to focus on this as needed. Whatever the severity of the traumatic brain injury, it is crucial to allow time to rest and allow your brain to heal. Do not go back to duty until cleared by a medical provider, as returning too soon can cause symptoms to recur. The length of time needed for recovery is vastly different for all people and also depends on the severity of the injury. Symptoms from a TBI can affect a service member’s ability to perform his/her duties safely and can put him/her at risk, as well as their fellow service members. You also do not want to put your recovery at risk by re-injuring your brain in a second incident before the first has healed. It is extremely important to be honest about how you feel and the symptoms you are experiencing. Taking time to get diagnosed and treated, can mean the difference between a healthy life going forward, and one with serious medical implications. As with any family member or loved one who has been exposed to a traumatic situation, it is imperative to be supportive and vigilant in recognizing any of the signs and symptoms of traumatic brain injury. Take the time to do the research, become educated in what to look for, and don’t hesitate to ask for help if you have any suspicion that there is a problem. Always be willing to listen, but read between the lines as well, since not wanting to show weakness, or still having problems, is a key factor in not reaching out for help. Better to ask and get help, on their behalf if necessary, than wait until there is a true crisis because help was delayed. Prism Health Advocates is a patient advocacy company that bridges the gap between individuals and the healthcare system. We also assist veterans in navigating the complexities of the VHA system.